During the infamous Duff Gardens episode of The Simpsons, Bart proclaims, “Hey man if the line is this long it’s gotta be good.” A moment later the gag is revealed: it’s a two-hour wait for guests to register a complaint, only here apparently the employee insults the patrons! In the real world, we hope a long line does in fact lead to a high quality experience – instead of the above situation – otherwise, something is not right. If you enjoy amusement parks, waiting is inevitable and the benefits usually outweigh the cost. Nevertheless, from entering the park, to food & beverage, to rides, everyone can appreciate shorter or faster moving queues. Delays at the parking tolls or queuing at an entrance can be frustrating without a quick access point, and that’s even before your day at the park has really begun. And those first impressions can linger. These incremental changes ideally all lead towards minimal or no queues at an entrance, improved efficiency, and customers retaining a happy frame of mind to begin their day. Big rides draw big crowds and that tends to mean lengthy waits, especially during a debut season for the latest record breaking roller coaster or innovative dark ride experience. There’s something to be said about building excitement and anticipation, but what is the threshold? How many people are willing to sacrifice most of the day queuing for rides and attractions? Keeping crowds excited about attractions, while minimizing their queue time for the duration of a visit is an operational challenge. Perceived value is likely to go down when only half the attractions are experienced for a once-a-year trip, and guests can’t spend money on games or merchandise when stuck in a 90-minute queue. Signboards and phone apps offering wait times are newer tools to aid a parkgoer’s day, possibly directing crowd flow to attractions with shorter wait times. Communication about delays or sudden closures is always welcome too. The use of reduced wait systems has become widespread. Professional sports, concerts, and theaters charge a premium for what’s considered more of a premium experience, so why not at theme and amusement parks too? Perhaps it just took longer to end up here due to origins of pay-per-ride at traditional amusement parks of long ago. These practices have altered queue management as much as anything else recently. Whatever the system may be called, the advertised benefits are the same: spend less time standing in line and enjoy more of your day. VIP tours exist as well, but those are lower volume and would not have the same constant influence on the regular line. A few early queue management arrangements were no-cost including Disney’s Fast Pass or Cedar Point’s short lived FreeWay and Ticket to Ride. While Disney’s systems have remained free since 1999, front of the line access can come at a hefty price. Many systems have multiple tiers and use dynamic pricing for busier days that can cost more than admission itself. Depending on the system utilized a guest earns the right to either jump in a shortened separate queue to bypass the regular line, or reserve a time for later while experiencing other rides, attractions, or shows. On the other hand, if too many guests in the standby queue find themselves greatly affected in favor of virtual queue or front-of-the-line riders, multiple guests’ experiences have been simultaneously diminished. Execution is certainly key regardless of the type of system used. Some are much more seamless than others (merge point vs. completely separate entrance). With or without a reduced wait offering, capacity also undoubtedly plays a role with queue management in such that swifter moving lines mean less overall waiting for everyone. 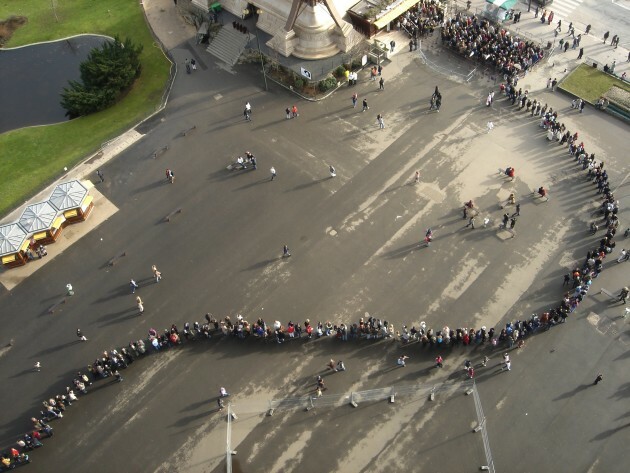 If the overall goal is to make everyone wait less, then operating at a capacity fitting for a given crowd plays a major role in shaping the pace at which lines move. Not every ride can handle 2,000 guests per hour, but reach outputs near maximum theoretical capacity and a difference is noticed. As a former ride host where meeting daily goals for throughput was expected, and still a very frequent visitor to theme parks, it’s easy for me to notice when operations are not as smooth as they could be. Budget may be the reason when there is a lack of staff or fewer ride vehicles are in operation, but a display of hustle and communication on the part of staff shows awareness of guest needs. That alone can make a huge difference in perception about the park’s interest in keep crowds moving and guests happy. Broader use of single-rider lines and attempts to fill every seat for every cycle may not make huge dents in capacity, but the little things can start to add up when looking for long term permanent solutions – and again, guests will notice and feel better cared for.